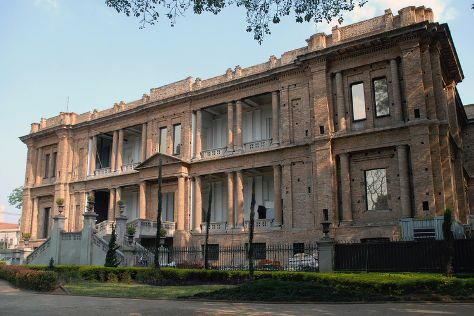 Start off your visit on the 11th (Sat): explore the world behind art at Pinacoteca do Estado de Sao Paulo, then admire the masterpieces at Museu de Arte de Sao Paulo Assis Chateaubriand - MASP, and then stroll through Ibirapuera Park. For maps, ratings, other places to visit, and more tourist information, read Sao Paulo road trip website . If you are flying in from Brazil, the closest major airports are Congonhas Airport, Guarulhos - Governador André Franco Montoro International Airport and Viracopos International Airport. In May, daily temperatures in Sao Paulo can reach 26°C, while at night they dip to 18°C. Wrap up your sightseeing on the 11th (Sat) early enough to travel to Rio de Janeiro. Kick off your visit on the 12th (Sun): kick back and relax at Copacabana Beach, stroll through Pedra do Arpoador, then kick back and relax at Praia de Ipanema, and finally appreciate the history behind Corcovado Christ the Redeemer. Here are some ideas for day two: don't miss a visit to Escadaria Selaron, admire the natural beauty at Theatro Municipal do Rio de Janeiro, then tour the pleasant surroundings at Leblon Beach, and finally admire the natural beauty at Jardim Botânico do Rio de Janeiro. 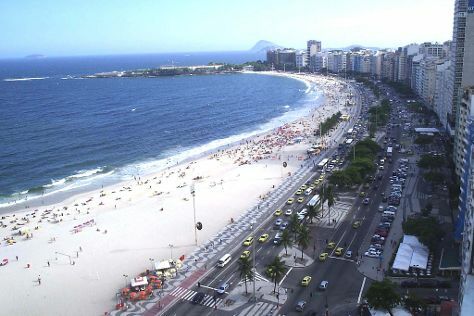 To find where to stay, photos, more things to do, and tourist information, go to the Rio de Janeiro trip planning app . Fly from Sao Paulo to Rio de Janeiro in 1.5 hours. Alternatively, you can do a combination of bus and flight; or drive. Traveling from Sao Paulo in May, things will get a bit warmer in Rio de Janeiro: highs are around 31°C and lows about 24°C. Wrap up your sightseeing by early afternoon on the 14th (Tue) to allow enough time to travel to Amsterdam. Amsterdam is known for museums, nightlife, parks, breweries & distilleries, and shopping. Your plan includes some of its best attractions: explore the world behind art at Van Gogh Museum, stroll through Vondelpark, appreciate the extensive heritage of Begijnhof, and take a stroll through The Jordaan. For ratings, maps, traveler tips, and more tourist information, go to the Amsterdam trip itinerary builder site . Getting from Rio de Janeiro to Amsterdam by flight takes about 15 hours. Other options: do a combination of flight and train. The time zone difference moving from Brasilia Time (BRT) to Central European Time (CET) is 4 hours. Traveling from Rio de Janeiro in May, you will find days in Amsterdam are a bit cooler (20°C), and nights are cooler (10°C). Finish your sightseeing early on the 17th (Fri) so you can take a train to Brussels. Brussels is known for historic sites, museums, nightlife, shopping, and theme parks. Your plan includes some of its best attractions: make a trip to Grand Place, examine the collection at Atomium, browse the exhibits of Belgian Comic Strip Center, and get in on the family fun at Mini-Europe. For reviews, other places to visit, where to stay, and tourist information, use the Brussels travel planner. Traveling by train from Amsterdam to Brussels takes 2 hours. Alternatively, you can drive; or fly. In May, daytime highs in Brussels are 19°C, while nighttime lows are 8°C. Wrap up your sightseeing on the 20th (Mon) early enough to drive to Bruges. On the 21st (Tue), explore the world behind art at Groeningemuseum, then get to know the fascinating history of Walplein, then indulge your thirst for a good beer at De Halve Maan Brewery, and finally steep yourself in history at Historic Centre of Brugge. 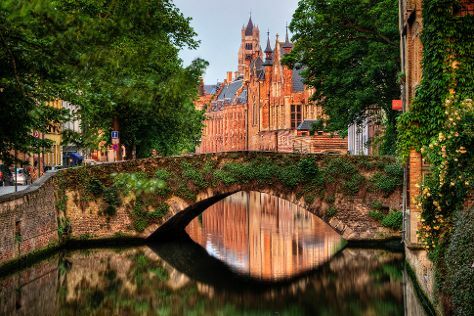 On the next day, examine the collection at Choco-Story - The Chocolate Museum, explore the activities along Minnewater Lake, enjoy breathtaking views from Belfry of Bruges, then contemplate in the serene atmosphere at Basilica of the Holy Blood, and finally don't miss a visit to The Markt. For maps, where to stay, traveler tips, and tourist information, you can read our Bruges trip itinerary planning app . Getting from Brussels to Bruges by car takes about 1.5 hours. Other options: take a train. In May, daytime highs in Bruges are 19°C, while nighttime lows are 9°C. Cap off your sightseeing on the 22nd (Wed) early enough to travel to London. London is known for museums, nightlife, historic sites, shopping, and parks. Your plan includes some of its best attractions: take in panoramic vistas at Coca-Cola London Eye, see the interesting displays at The British Museum, step into the grandiose world of Buckingham Palace, and admire the landmark architecture of Houses of Parliament. To find more things to do, other places to visit, photos, and other tourist information, read our London trip builder website . You can do a combination of car and train from Bruges to London in 3.5 hours. Alternatively, you can do a combination of bus and train; or do a combination of car and ferry. Due to the time zone difference, you'll gain 1 hour traveling from Bruges to London. In May, plan for daily highs up to 19°C, and evening lows to 9°C. Wrap up your sightseeing on the 25th (Sat) early enough to take a train to Liverpool. Kick off your visit on the 26th (Sun): don't miss a visit to The Black Pearl New Brighton, then get your game on at CoverStar Experiences, then take in the waterfront at Royal Albert Dock Liverpool, and finally see the interesting displays at Merseyside Maritime Museum. To find traveler tips, reviews, maps, and tourist information, refer to the Liverpool trip itinerary builder . Traveling by train from London to Liverpool takes 2.5 hours. Alternatively, you can drive; or do a combination of flight and train. May in Liverpool sees daily highs of 18°C and lows of 9°C at night. Finish your sightseeing early on the 26th (Sun) so you can travel to Dublin. Dublin is known for museums, breweries & distilleries, historic sites, nightlife, and parks. Your plan includes some of its best attractions: sample the tasty concoctions at Guinness Storehouse, enjoy the scholastic atmosphere at Trinity College Dublin, brush up on your knowledge of spirits at Jameson Distillery Bow St., and take in the spiritual surroundings of Saint Patrick's Cathedral. To find ratings, other places to visit, photos, and other tourist information, you can read our Dublin tour itinerary maker tool . You can fly from Liverpool to Dublin in 3.5 hours. Other options are to do a combination of train and flight; or ride a ferry. In May, daily temperatures in Dublin can reach 17°C, while at night they dip to 7°C. 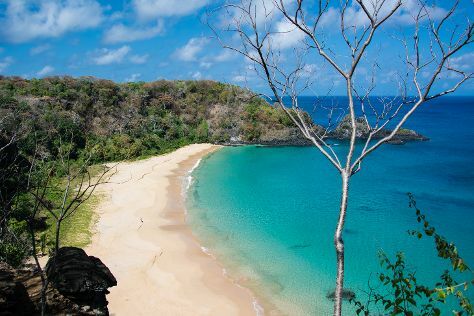 Wrap up your sightseeing on the 29th (Wed) to allow time to travel to Fernando de Noronha. Kick off your visit on the 30th (Thu): stroll through Praia do Sueste, tour the pleasant surroundings at Baia do Sancho, and then see the interesting displays at Projeto TAMAR Fernando de Noronha - Patrocínio PETROBRAS. Get ready for a full day of sightseeing on the 31st (Fri): enjoy the sand and surf at Fernando de Noronha, look and learn at Aulas de Energia - Espaco Usina Solar Fernando de Noronha, and then head outdoors with Baia dos Porcos. To see where to stay, ratings, and tourist information, go to the Fernando de Noronha day trip app . Fly from Dublin to Fernando de Noronha in 18 hours. Alternatively, you can do a combination of train and flight; or do a combination of bus and flight. You'll gain 2 hours traveling from Dublin to Fernando de Noronha due to the time zone difference. Traveling from Dublin in May, things will get much hotter in Fernando de Noronha: highs are around 34°C and lows about 29°C. Wrap up your sightseeing on the 31st (Fri) early enough to travel back home.